Did you know that commercially produced lettuce is sprayed with insecticides, pesticides and herbicides about 10 times before it’s ready for sale? Honestly… that’s enough to put you off your salad! 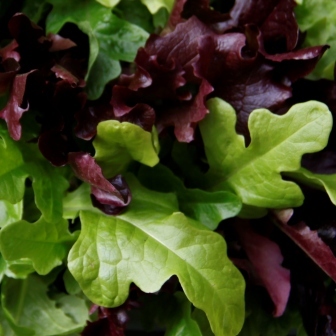 Growing fresh delicious organic lettuce is easy. You need good soil, plenty of water and temperatures between 10 and 20 degrees C … in most UK gardens those conditions are usually present between April and October. Slugs and snails love lettuce so I prefer to sow the seed in modules in my unheated greenhouse and allow the seedlings to produce several leaves before planting out or potting on. When the roots are well established and you have healthy vigorous plants with about five or six leaves they are ready for planting outside. I planted these Oak Leaf lettuce close together in my herb bed today because I love the way they look with the chives and golden oregano. 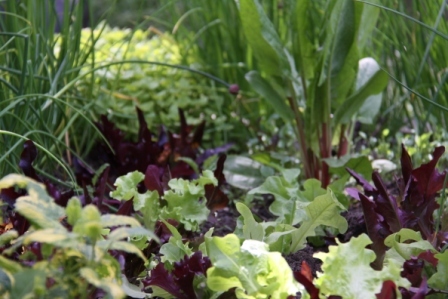 With loose leaved lettuce like these you can either pick a few young leaves for a sandwich or cut the whole plant – the lettuce will soon grow again. Previous PostEnglish BluebellsNext PostWildflowers or Weeds?